What comes first in your heart? Is it church attendance and service to God? A mark of the Spirit is faithfulness (Gal. 5:22-23). We are all called to serve and edify other believers. Our service glorifies our heavenly Father. Serving in church with little ones can be difficult. One simple way to serve is to attend church. We are to be faithful in that attendance. Faithful means dependable, trustworthy, and to be counted on. Faithful in church attendance is being at every service, when possible. Not just being there to serve - but faithful in listening to the preaching. Our service can overshadow sometimes the necessity of hearing God's Word preached. We can serve in every area offered...and miss every opportunity to hear God's Word. As mothers, we know that our family comes first, but one thing I have come across is that people neglect faithfulness in attending church - using their families as the excuse. 1. My children are too young to drag to church. It is hard to keep them entertained. Our job is not to entertain our children. Our job is to educate our children. Sunday nights have been a great opportunity to teach my four and six year old how to sit quietly and listen. I bring fruit snacks and coloring books to help. 2. My family member is sick and needs help all of the time. Our job is to care for our family, but one day a week to find help is not wrong. If there are others in the family who are not allowing you to have a break - even on Sunday mornings, something needs to be discussed. 3. We need “family time” to spend together. I agree that families need time to spend time together, but it can be done on a different day of the week. If your schedule is so busy that Sundays are the only family day you can have – you are too busy. One of the most valuable things I have learned from my parents was going to church and serving God came first in our family. If any activity (whether sports, educational, or otherwise) was held on Sunday - we did not participate. When it came time for me to get a part-time job in high school, my parents were adamant that I NOT work on Sundays. My dad said to me, "At this point in your life (as a high-schooler) no job is more important than church." We were at every service, whether we felt like it or not. We went to church when we were tired. We went to church when no one else would. We never missed an opportunity to hear God's Word being preached. So what does faithfulness look like in service to God, especially in church attendance? When we serve, including attending church, we need to be dependable. People need to rely on us to be at church. Whether we are just sitting and receiving, or serving and giving – we need to be at church. Remember: missing a lot of preaching to "serve" benefits no one - especially your own spiritual walk. Saying yes to all opportunities to serve is not being faithful. We need to be wise and chose the things that are best. One of the books I am looking forward to reading this fall is Lysa TerKeurst’s new book The Best Yes. She writes about how to make wise decisions with endless demands. We cannot say yes to everything – even if it is a ministry. Twice in the past few years I have said no to something I was involved in at church. I stopped serving in two ministries. I enjoyed them both, but realized with three small children, I was not going to be able to be able to hear any preaching. Because I said no to both of those ministries, it became a time of great growth for me. I was able to come to church and just listen. Faithfulness is a heart issue. When we put God first in our lives, we think that just means prayer and Bible reading. Although those things are vital, going to church and faithfully serving others is also evident of God being first. Before we can teach our children the value of God, they need to see it in our own lives. What better way to show our children how important God is to us, than by making an effort to attend church? We cannot be faithful apart from the Vine. To be dependable, discerning, and devoted we need first to be connected to Jesus. As our relationship with Christ grows and develops, we find that being faithful is part of the fruit of the Spirit. Sometimes it is hard to be faithful. A few weeks ago I was struggling as to whether to attend church on Sunday. My excuses were: (1) It was just one Sunday. (2) Jason was working (so I would have to get them all ready by myself). (3) I was scheduled to work in the nursery – without us, half the nursery isn’t there anyway. (4) My children are the only two kids in their class. Growing up, my parents went to church even on days they did not feel like it. I want to instill that same devotion in my children. I want to teach my children that we need to be listening to God’s Word, even if we are the only ones there. I want them to know that going to church is more important than my own comfort. We went to church that Sunday. I was (am) so glad we did! There will be times (after having a baby....a prolonged illness...etc) that will prevent us from going for a little while. When those times turn into months...and years...we have a problem. 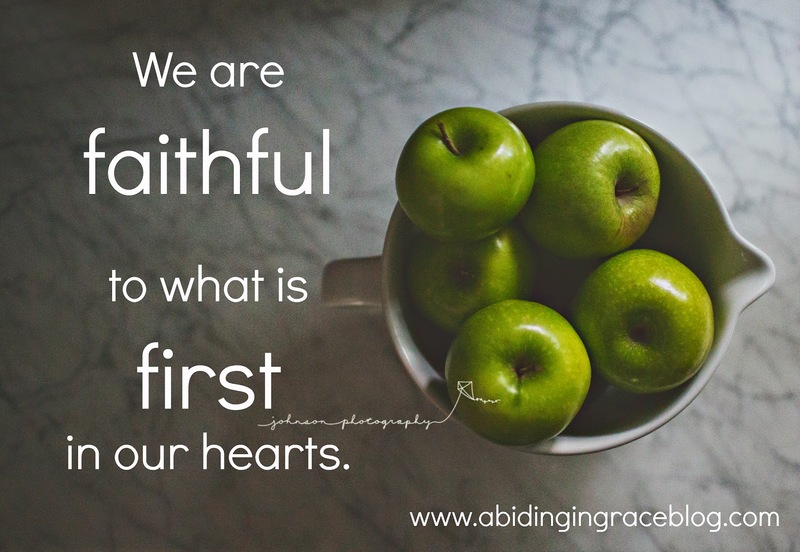 We are faithful to what is first in our hearts. Is it your own ideals?